Our Pico series is designed to provide the unmistakable look of marble for an exceptional price. Pico glazed ceramic mosaics wall tile features the refreshed look of marble through HD digital printed images. Non-vitreous ceramic tile delivers a warm beige colour with light ivory undertones to highlight veins. Jeffrey Court's ceramic & natural stone mosaic tiles make a great complement to a wide variety of decorative styles and add a level of design sophistication to any room. Ceramic mosaic tiles are great by themselves or can be installed alongside stone or ceramic field tiles (sold separately) to create a coordinated look. Mesh-mounted mosaic tiles are easier to install than traditional tile formats and can be used as whole sheets or cut to make inexpensive feature strips. The standard in craftsmanship set forth by the Merola Tile Cobble Cimarron 12-inch x 12-inch x 12 mm Ceramic Mosaic Tile is exemplary. Each earth-toned tile is an individual work of art. The finishing flourish. An amazing crystallized glaze that adds a sparkling sheen. In earthy tones of chocolate and tawny, this tile has the feel of an ancient artifact made new again. Use this variably patterned tile for interior walls of distinction and light-duty residential floors. Check out the rest of the Cobble series for other patterns and sizes of this lovely look. Bring a modern aesthetic into your living space with the Merola Tile Laceo Beige 11-5/8-inch x 11-5/8-inch x 6 mm Porcelain Mosaic Tile. This beige-colored tile has a glazed, low-shine, satin finish surface and incorporates square tiles with an eclectic pattern to provide a contemporary look. The strong mesh backing material makes for easy installation and the durable porcelain material and impervious water absorption rating make this mosaic a great choice for indoor and outdoor applications. The Merola Tile Meta Super Subway 10-inch x 11-3/4-inch x 8 mm Stainless Steel Over Ceramic Mosaic Tile adds sleek, contemporary style and charisma to almost any space. Each individual oversized subway tile is approximately 2 inch x 4 inch and features a high-sheen, brushed-metal finish. Use non-sanded grout and plastic tools (sold separately) during installation to help prevent the tile from scratching. 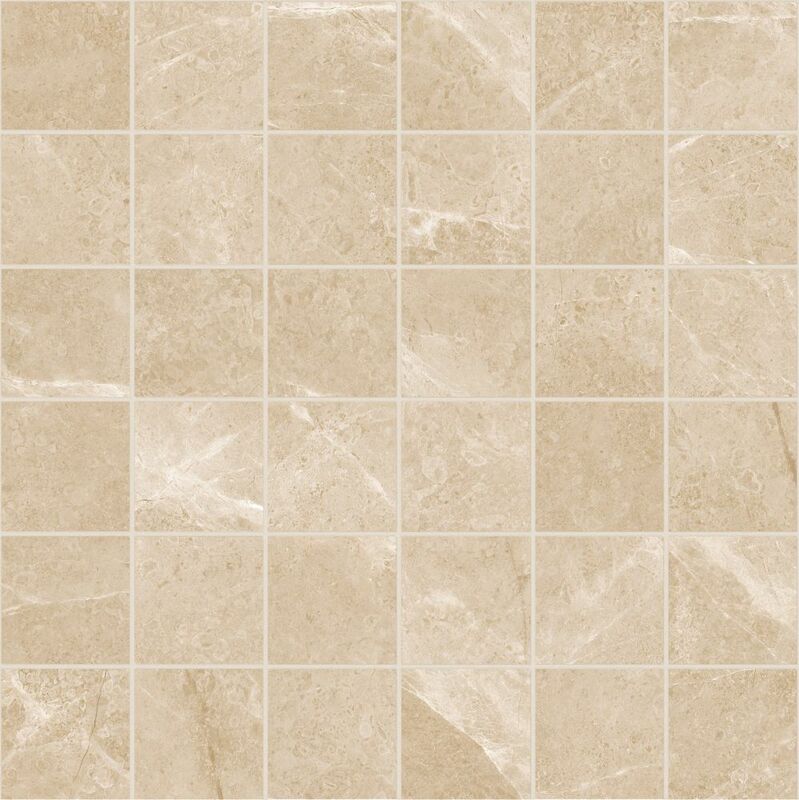 2-inch x 2-inch Pico Beige HD Ceramic Mosaic Tile (9.68 sq. ft. / case) Our Pico series is designed to provide the unmistakable look of marble for an exceptional price. Pico glazed ceramic mosaics wall tile features the refreshed look of marble through HD digital printed images. Non-vitreous ceramic tile delivers a warm beige colour with light ivory undertones to highlight veins.